The Icefields Parkway is the most popular route to visit Jasper National Park. The Parkway runs 150 miles from the outskirts of Lake Louise at its south end to Jasper in the north. The Icelfields Parkway goes past some of the most beautiful lakes in the Rockies just as you leave Banff National Park. Don’t miss Num-Ti-Jah Lodge on Bow Lake along the parkway. Shortly thereafter is the turnout to the Peyto Lake parking lot. Many think it’s more impressive than Lake Louise. 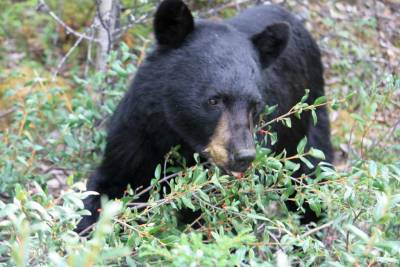 Watch for black bears along the road side, but don’t get out of your car. 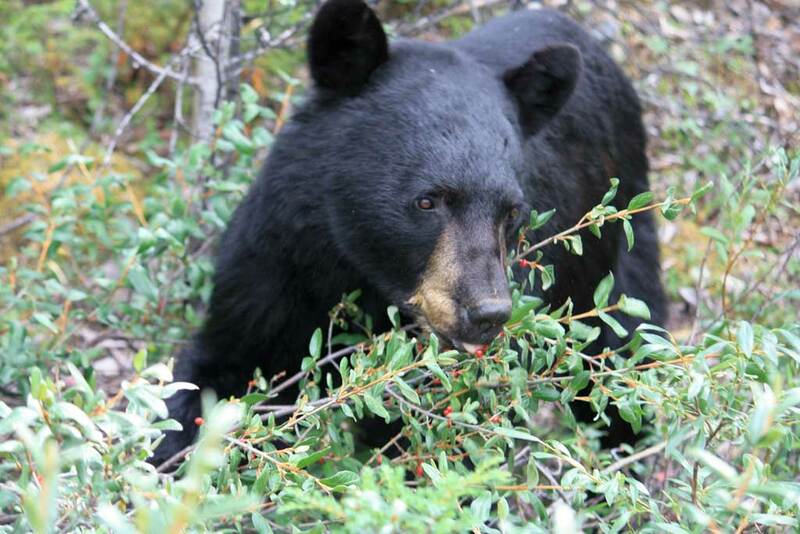 Bears often collect berries at the roadside in early fall. After passing the braided gravel river bed of the North Saskatchewan River Crossing, the Icefields Parkway arrives at the Athabasca Glacier, which is part of Columbia Icefields. 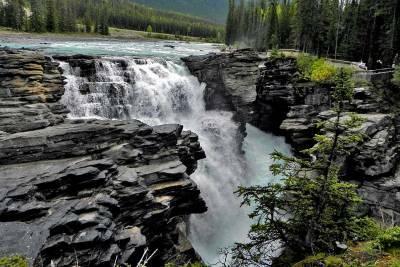 The route then passes roadside stops at Sunwapta Falls and Athabasca Falls. 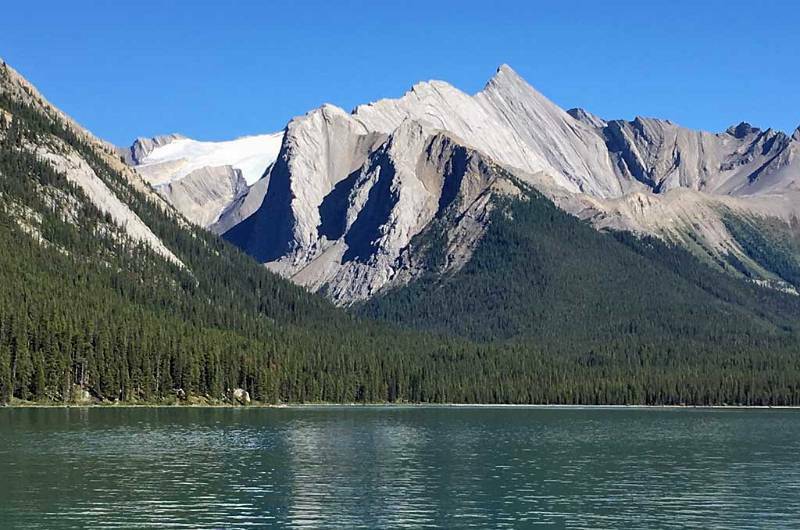 For a side trip, hike to the small glacial lake at Mount Edith Cavell. 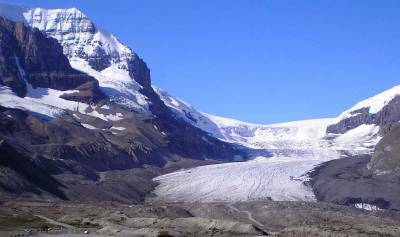 The most popular stop on the Icefields Parkway is the Columbia Icefields, which includes the Athabasca Glacier. Busloads of tourists from all over the world arrive at the Glacier View Inn overlooking the Athabasca Glacier. 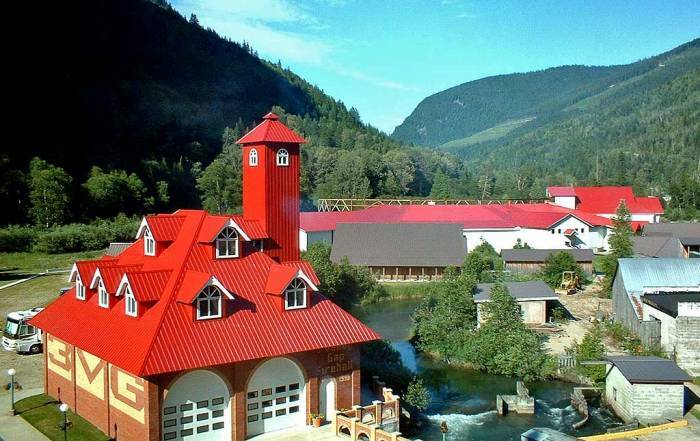 The hotel is part of the Columbia Icefield Discovery Centre, which includes national park information, a restaurant and souvenirs. The most important reason to stop here is to take Ice Explorer Glacier Tour that drives on top of the Athabasca Glacier. Once your Ice Explorer bus gets top of the glacier, you can get out and walk on the ice. 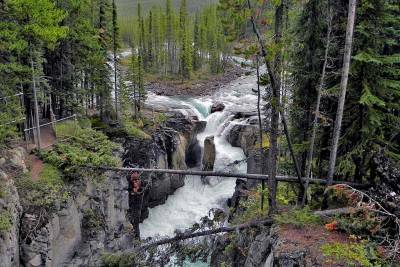 Icefields tours can also include the nearby Glacier Skywalk. The Glacier View Inn is an excellent place to spend the night too. Half the rooms look across the valley at the Glacier. You can park just below the Athabasca Glacier and hike to the base of Athabasca Glacier in about half an hour. Warning signs prohibit climbing on the base of the glacier, because people have died from collapsing ice. Hikers can die from hypothermia in an ice collapse. The most astounding part of the hike to the base of the Athabasca Glaciers is the markers showing the steady retreat of the glacier over time. In the early 1900’s the glacier reached the bottom of the valley, but now it only reaches a third of the way down. You can also hike with a guide to the top of the icefields. At the top of the Columbia Icefields the snow melt can end up in the Atlantic, the Arctic or the Pacific. Fairmont Jasper Park Lodge – luxury hotel on Beauverte Lake just outside of the town of Jasper. 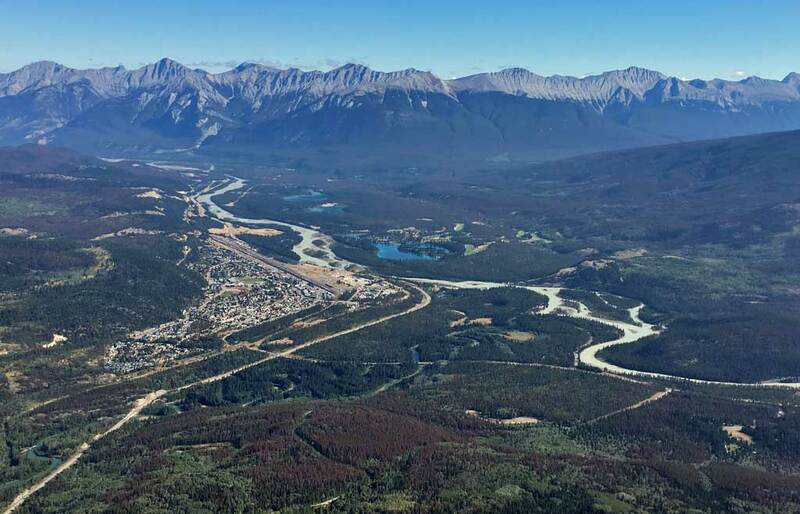 You can stay at the Jasper town site, but the town of Hinton has less expensive hotels. Hinton is about an hour from Japser by car. Sunwapta Falls Rocky Mountain Lodge – an hour south of Jasper on the Icefields Parkway. Glacier View Inn – units facing the Columbia Icefields, about 1.5 hours south of Jasper. Maligne Lake is one of the most widely recognized photo stops in the Canadian Rockies, because of Spirit Island. Spirit Island became world famous in the Kodak Colorama display in Grand Central Station, New York in 1950. Suddenly lots of people wanted to see Spirit Island and that meant all kinds of people who wanted to visit Jasper National Park. You can arrange a tour from Jasper to Spirit Island, but you can also drive to the boat landing yourself. 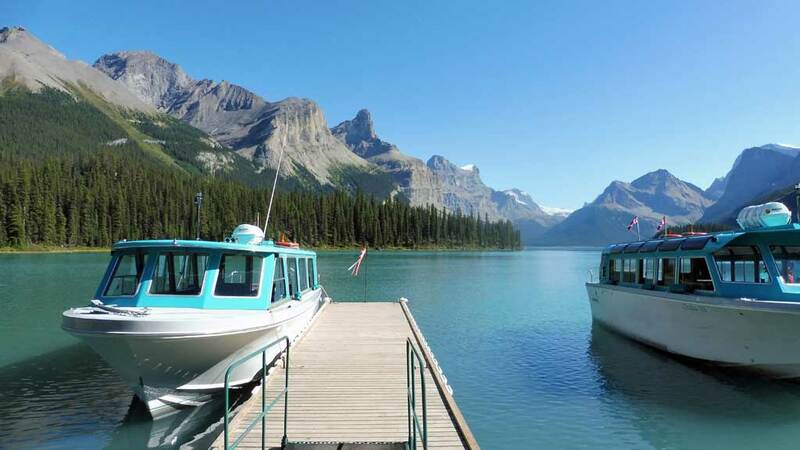 If you drive there, you can book your own boat ride to Spirit Island online. Maligne Lake is 30 miles from Jasper. 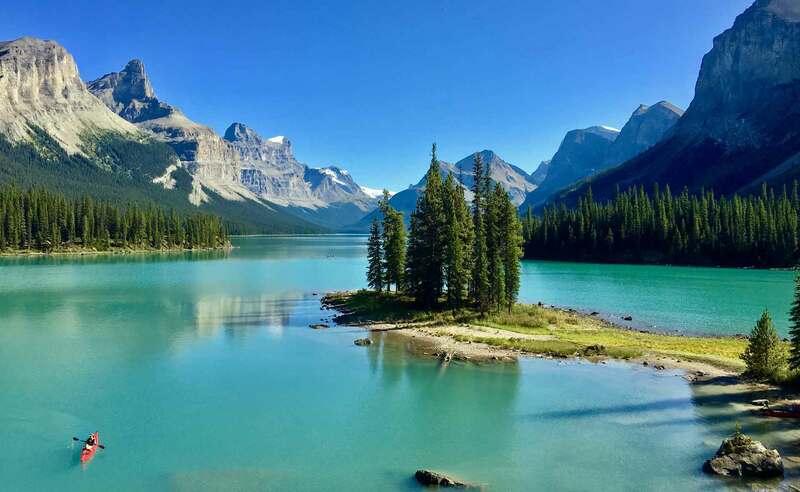 Just before Maligne Lake, you pass Medicine Lake, which is full in the spring and empty in the summer every year. 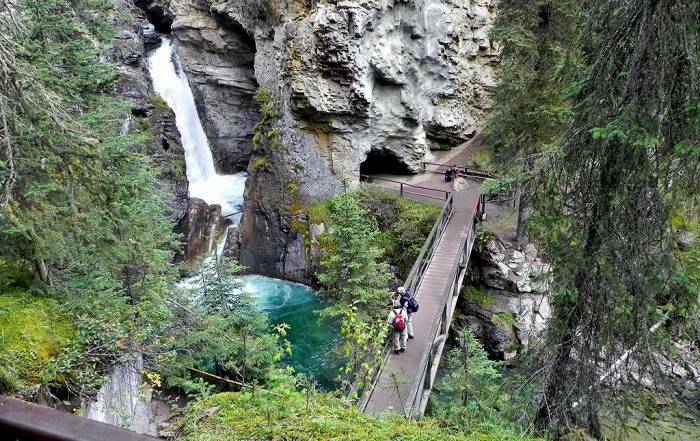 When you visit Spirit Island on Maligne Lake, stop on your drive and hike Maligne Canyon on the way. 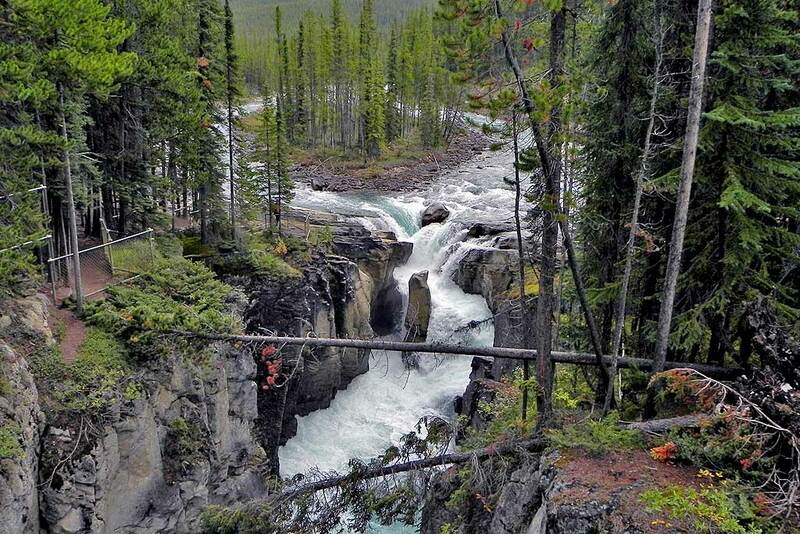 Maligne Canyon is about 10 minutes from Jasper. The free trail criss-crosses the canyon in a series of 6 bridges. Start at the parking lot & tea house at the top of the Maligne Canyon. Then work your way down over the first few bridges. The views into the canyon are fabulous. If you hike the entire route down, you will eventually walk right out of the canyon. 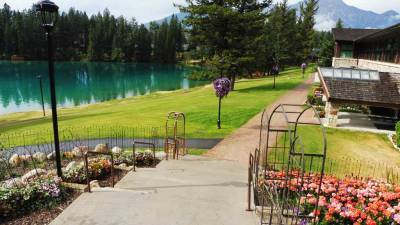 Visit Fairmont Jasper Park Lodge. You can walk the grounds, rent a canoe and enjoy a meal at their bar or restaurants. Ride the Jasper Tramway which is located a few minutes south of Jasper. Have breakfast, lunch or dinner at the top. On a clear day you can see the valley, the Victoria Cross Ranges and even Mount Robson in British Columbia. Mount Robson Provincial Park – Mount Robson is the highest peak in the Canadian Rockies. Hike to the Berg Glacier. 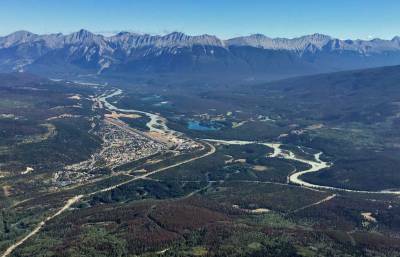 Banff National Park joins Jasper National Park to its south. Take a day trip to see all the attractions at the West Edmonton Mall. Banff and Jasper are in the same glacial valley, so they have similar weather. Jasper National Park weather is good in July and August, but evenings are cool. Snow is possible any month of the year. 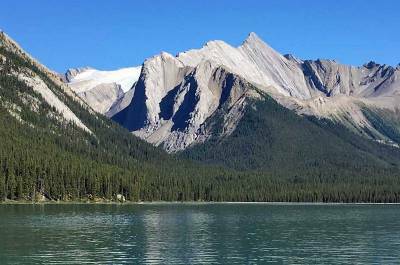 Fall brings cold Jasper National Park weather by late September. Many tourist facilities are only in operation from May through September. January and February are the height of extremely cold winter weather, making for excellent skiing at Marmot Basin. You need a vehicle to get to Jasper National Park. The nearest airport is in Edmonton, which is 4 hours away on the #16 Highway. You will either need to rent a car or join an organized tour. 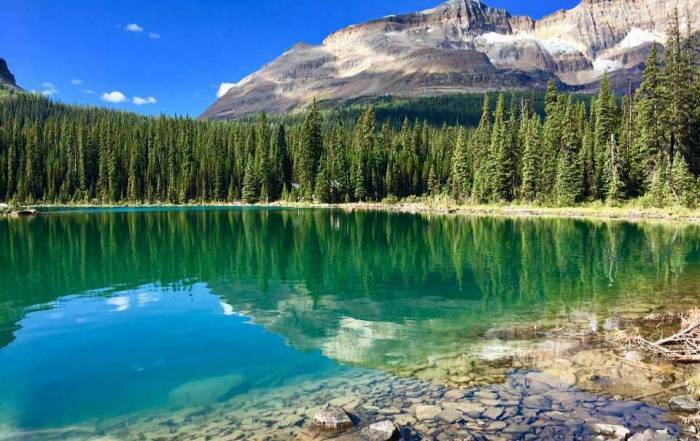 You can also get to Jasper National Park on the Icefields Parkway which starts in Banff National Park to the south. So, another option is to fly to Calgary and start by driving to Banff National Park. Calgary is 5 hours from Jasper. If you visit both Jasper and Banff, you can save 4 – 5 hours of driving time by making a one way car rental between Edmonton and Calgary. Jasper National Park is in the Canadian Rocky Mountains. The park boundary is shared with Banff National Park. 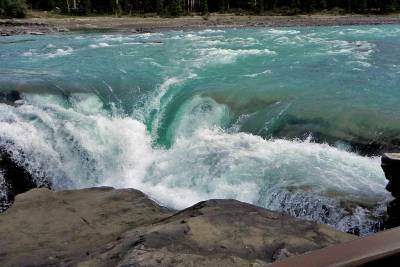 Just to the west in the province of British Columbia is Mount Robson Provincial Park. 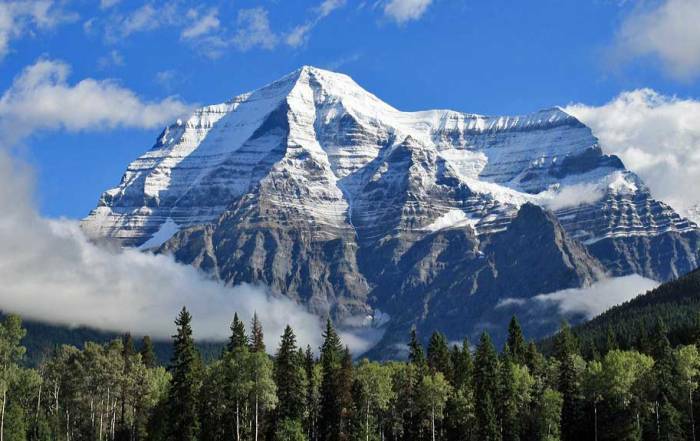 Mount Robson is the highest mountain in the Canadian Rockies. The town of Jasper was built as a railway town for the Canadian National Railway. Early railroads tried to lure tourists to the west with luxury lodges. So, the Fairmont Jasper Lodge opened to the public in 1922 and still operates in the national park today.